This module does NOT enable ActiveDirectory integration for user sign in. User and Group synchronization is done by your license level in Decisions. Includes Flow Steps that allow user to build workflows that manage Active Directory . User can use this Module to create users, groups, their associations and more using the flow engine in Decisions	with these additional steps. Approvals	is a Module that has several simple Flows that are targeted toward the activity of requesting and approving things in an organization. Approvals	has an easy Flow for approving anything, and a more comprehensive Flow for doing approvals that are multi-level, parallel, tracked, and more. User can use the Approval Flows	in the workflows as Linked Flows, directly, or user can simply use them as models on which to base their own work. Authorize.NET	is a service that allows user to process credit card payments. The Authorize.NET module is a set of Flow Steps	that gives you access to Authorize.NET inside the Decisions	Flow engine. Using this module makes it easy to accept credit card payments from a form in a Flow . Box.com	is a cloud file storage service. This module allows user to store files in Box.com	from a Flow , or get files from Box	in a Flow . Decisions.Core	is not a module user can install, but user will see it in the System/Administration	folders. This module provides most of the Workflows , Pages , and Rules that make up the base Decisions System	. For example: the default user home page is in this Core	module. This module should NOT be installed on any production machine as it installs a number of sample workflows that are used for demonstration and learning purposes. Decisions Designer Repository	is a configuration management service that allows the storing, versioning and installation of Decisions Studio	created artifacts. This module is installed by the Installer	when the server is setup as a development server. A development server provides sandboxed work environments for users and has the Decisions.DesignerRepository installed by default. Do NOT install this module manually. This module has Flow Steps	that will let you send a document to Docusign	so that Docusign	can capture electronic signatures and initials. The steps are limited to using X,Y position in the document to mark where to sign, or using Docusign’s “Tag”	ability to indicate areas in the document that require signatures. In Decisions	it is a common pattern to send the document out, through Docusign	, for signatures and then use the “Wait on External Event”	step to monitor Docusign , watching for the document to be fully executed before pulling it back into the workflow. This module adds functionality for processing large amounts of batch data, persistent work queues and data sharing in active/active clusters. This module is only available with enterprise licenses. This module has a few very special Flow Steps	that are used to execute formulas in an Excel spreadsheet and get the results back. 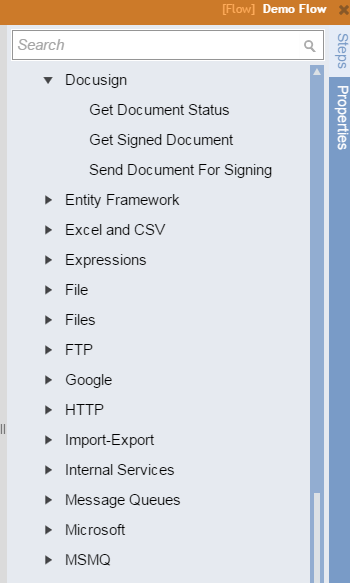 These steps will show up in the Flow Designer Toolbox	here: Data/List/Excel and CSV/Extra. Flowsets	and Rulesets	allow the construction of complex rules and similar flows that share common patterns. Each Flow or Rule will be evaluated and a composite result will be run. 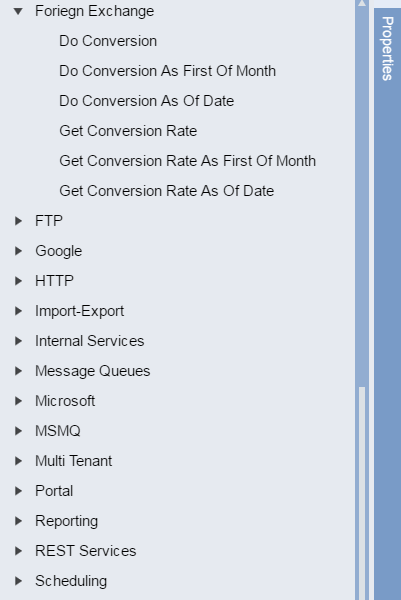 All of the Rules and Flows are executed using one service call or as a single step in a calling Flow . This module adds a full HL7 Engine	to the Decisions	platform allowing you to combine the power of the Flow, Form, Rule, and Report Designers with HL7	data and common HL7	connection types to manage medical data streams. The HL7	module includes data types for all standard messages, as well as interfaces. Decisions.Hosting	contains the handling of multi-tenant functionality and is installed by the system when the server is a multi-tenant server. This module should NOT be installed by user. The Local	module is not a module user can install, but is available on all Decisions installations. This module allows user to put new things into Decisions that are not a part of a formal, structured module like the others listed here. This is very commonly used to add custom Flow	steps to the Flow Engine or custom Rule parts to the Rule Designer. RabbitMQ	is a .NET messaging system for application to application communication. The RabbitMQ	module adds RabbitMQ	capability into the Decisions	messaging service and lets you connect Flows , that you have built in Decisions to RabbitMQ	queues as subscribers so that the Flows can work messages. User can also push messages to queues using a simple Flow Step. Rememdy	is an enterprise grade help desk ticketing system for IT and Systems Management needs. This module includes Flow Steps that allow a user to get, create, and modify tickets in a Remedy system as a part of a Flow . This module for use in very special circumstances using multi tenancy and Active Directory Authentication. For most Salesforce	interactions, the webservice integration in Decisions Studio	will generate steps against your Salesforce Enterprise WSDL	including all custom data types and functionality. This module adds a few specific helper steps to deal with some integration difficulties in the Salesforce	webservices around handling documents. Integration with Microsoft’s System Center Configuration Manager for automating IT management tasks. This module includes Settings and Flow Steps for use in the Flow Designer that can be used to send Task Sequences to machine collections in order to automate common system management functions. Examples would be: installing software updates to computers in a company only after a manager approves the updates using our flow engine. Note	: These steps are only tested with MS SCCM 2012. Decisions SCO	is a module for integrating with Microsoft System Center Orchestrator . This module is only practically used in concert with the SCCM	module . Decisions.Scripting	allows the execution of C# code within a Flow Step . Code can be typed right into the steps editing properties and is compiled and executed. This integration is designed for programmers who want to inject special functionality into a Flow without using the SDK . The Sharepoint	module includes Flow Steps	for dealing with Lists	and Documents	in Sharepoint	using the Flow Designer	. This module is NOT	needed to embed Decisions	Forms, Flows , and user driven Workflows in Sharepoint	. This module is only needed if user wants the Flow Engine to be able to access, update, modify lists and documents in Microsoft Sharepoint. The Symantec Management Platform	is a system for central IT administration and system management activity like deploying software and updating computer configurations across an enterprise. Decisions has Flow Steps for use in the Flow Designer that allows you to add Workflow all around the Symantec Management Platform. For example: user could assign tasks to a manager using our workflow, and only once approved user could activate a management activity in Symantec Management Platform to deliver software or update a computer. This module provides integration with Twillio	(https://www.twilio.com/ ) and has Steps for automating DTMF	interactions as well as SMS	interactions. Decisions.UnitTests	is the unit test framework used by the Decisions QA	team to validate the product functionality. This module should NOT be installed on any production machine as it installs a large number of test oriented rules and flows. Do NOT install unless directed by Decisions Support. It is included only to allow Decisions Support	to run a battery of tests on servers to ensure that the server infrastructure is properly functioning. This module is the base of project importing functionality from other formats. Note: it must be modified in order to function. If user have a large number of Workflows that need to be imported from another system, contact Decisions Support	to discuss how to leverage this module. This module has steps for turning Microsoft Word	documents into PDF	documents.